Park Here, the pop-up indoor park space in Nolita, was definitely one of this weekend's scenes. Everyone seems to need a little reminder that some day summer will be here again when we can sit on real grass, listening to real birds. At least through January, sitting on faux grass while eating cupcakes, or doing yoga, will just have to do. Openhouse Gallery, a New York event venue has decided to let their space on Mulberry street be transformed into a park with events and food throughout the month of January. 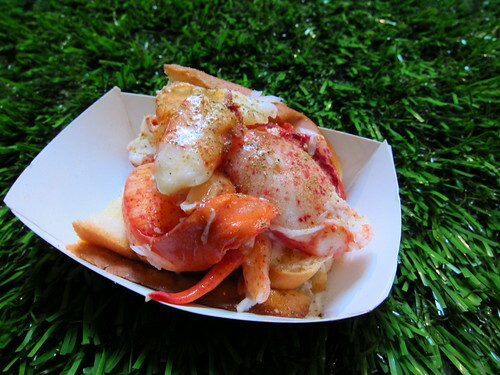 For their opening weekend, some of our personal favorites were on hand: Robicelli's, Luke's Lobster, and Mexicue. 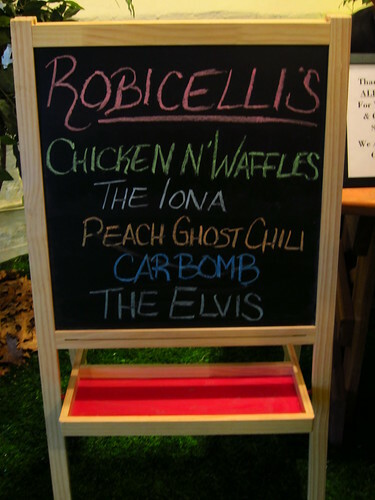 Immediately upon entering I got hands on one of Robicelli's famous Chicken & Waffle cupcakes. 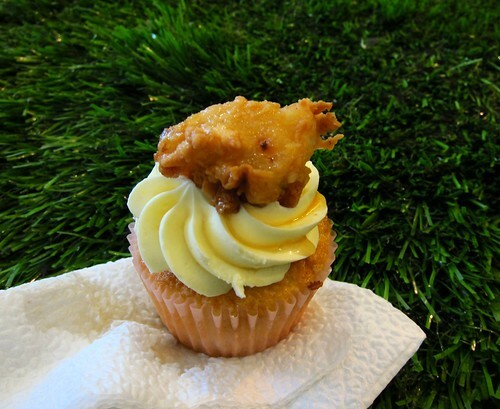 Yes, fried chicken and maple syrup on a cupcake-so wrong, yet so right. It's a bit of a puzzle eating this, I went with an opening bite of just frosting and cake, then slowly eating it as a frosting sandwich. Bites with all three components are like delicious gold ring prizes. Luckily, Matt Robicelli is a master at frying these little chicken pieces; they're moist, but not greasy, and perfect with frosting and cake. I like to pretend that the chicken n' waffles cupcakes wasn't savory and can't be classified as lunch, which meant that I still needed to get some sustenance. Well, after Brownie and Little B arrived, we chose to split one of Luke's Lobster signature rolls. "Wait, are you switching sides? Do you like lobster rolls?" A person is always allowed to change their mind or tastes, and maybe I've taken a liking to Luke's rolls. You still won't find me dipping lobster meat into butter anytime soon. But Luke's rolls with their buttered toast and fresh lobster meat may have a follower in me. Click here for a look at the other events going on in this space during the month. I had that cupcake and the car bomb this past weekend. Finally nice to have a good cupcake. Thank you guys so much for coming to see us (and bringing Little B)! As happy as we are that we were incredibly busy, we really wish we could have spent more time with you (and little B). Since it was so much fun, we've scheduled another pop-up in that space on January 29th, which happens to be Matt's 30th birthday weekend. Come down and say hi! (AND BRING LITTLE B! You can just drop him off with us if you want). Both of those things look retarded-ly good. So jealous.